Quantum entanglement is a physical phenomenon that occurs when pairs or groups of particles are generated or interact in ways such that the quantum state of each particle cannot be described independently—instead, a quantum state may be given for the system as a whole. Measurements of physical properties such as position, momentum, spin, polarization, etc. performed on entangled particles are found to be appropriately correlated. For example, if a pair of particles is generated in such a way that their total spin is known to be zero, and one particle is found to have clockwise spin on a certain axis, then the spin of the other particle, measured on the same axis, will be found to be counterclockwise. Because of the nature of quantum measurement, however, this behavior gives rise to effects that can appear paradoxical: any measurement of a property of a particle can be seen as acting on that particle (e.g. by collapsing a number of superimposed states); and in the case of entangled particles, such action must be on the entangled system as a whole. It thus appears that one particle of an entangled pair “knows” what measurement has been performed on the other, and with what outcome, even though there is no known means for such information to be communicated between the particles, which at the time of measurement may be separated by arbitrarily large distances. Such phenomena were the subject of a 1935 paper by Albert Einstein, Boris Podolsky and Nathan Rosen, describing what came to be known as the EPR paradox, and several papers by Erwin Schrödinger shortly thereafter. 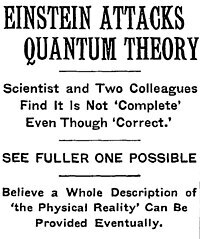 Einstein and others considered such behavior to be impossible, as it violated the local realist view of causality (Einstein referred to it as “spooky action at a distance”), and argued that the accepted formulation ofquantum mechanics must therefore be incomplete. Later, however, the counterintuitive predictions of quantum mechanics were verified experimentally. Experiments have been performed involving measuring the polarization or spin of entangled particles in different directions, which—by producing violations of Bell’s inequality—demonstrate statistically that the local realist view cannot be correct. This has been shown to occur even when the measurements are performed more quickly than light could travel between the sites of measurement: there is nolightspeed or slower influence that can pass between the entangled particles. Recent experiments have measured entangled particles within less than one part in 10,000 of the light travel time between them. According to the formalism of quantum theory, the effect of measurement happens instantly. It is not possible, however, to use this effect to transmit classical information at faster-than-light speeds (see Faster-than-light → Quantum mechanics). Quantum entanglement is an area of extremely active research by the physics community, and its effects have been demonstrated experimentally with photons, electrons, molecules the size of buckyballs, and even small diamonds. Research is also focused on the utilization of entanglement effects in communication andcomputation. May 4, 1935 New York Timesarticle headline regarding the imminent EPR paper. The EPR paper generated significant interest among physicists and inspired much discussion about the foundations of quantum mechanics (perhaps most famously Bohm’s interpretation of quantum mechanics), but relatively little other published work. So, despite the interest, the flaw in EPR’s argument was not discovered until 1964, when John Stewart Bell proved that one of their key assumptions, the principle of locality, was not consistent with the hidden variables interpretation of quantum theory that EPR purported to establish. Specifically, he demonstrated an upper limit, seen in Bell’s inequality, regarding the strength of correlations that can be produced in any theory obeying local realism, and he showed that quantum theory predicts violations of this limit for certain entangled systems. His inequality is experimentally testable, and there have been numerous relevant experiments, starting with the pioneering work of Freedman and Clauser in 1972 and Aspect’s experiments in 1982. They have all shown agreement with quantum mechanics rather than the principle of local realism. However, the issue is not finally settled, for each of these experimental tests has left open at least one loopholeby which it is possible to question the validity of the results. The work of Bell raised the possibility of using these super strong correlations as a resource for communication. It led to the discovery of quantum key distribution protocols, most famously BB84 by Bennet and Brassard and E91 by Artur Ekert. Although BB84 does not use entanglement, Ekert’s protocol uses the violation of a Bell’s inequality as a proof of security. David Kaiser of MIT mentioned in his book, How the Hippies Saved Physics, that the possibilities of instantaneous long-range communication derived fromBell’s theorem stirred interest among hippies, psychics, and even the CIA, with the counter-culture playing a critical role in its development toward practical use. Quantum systems can become entangled through various types of interactions. (For some ways in which entanglement may be achieved for experimental purposes, see the section below on methods). An entangled system has a quantum state which cannot be factored out into the product of states of its local constituents (e.g. individual particles). The system cannot be expressed as a direct product of quantum states that make up the system. If entangled, one constituent cannot be fully described without considering the other(s). Like the quantum states of individual particles, the state of an entangled system is expressible as a sum, or superposition, of basis states, which are eigenstates of some observable(s). Entanglement is broken when the entangled particles decohere through interaction with the environment; for example, when a measurement is made. The seeming paradox here is that a measurement made on either of the particles apparently collapses the state of the entire entangled system—and does so instantaneously, before any information about the measurement could have reached the other particle (assuming that information cannot travelfaster than light). In the quantum formalism, the result of a spin measurement on one of the particles is a collapse into a state in which each particle has a definite spin (either up or down) along the axis of measurement. The outcome is taken to be random, with each possibility having a probability of 50%. However, if both spins are measured along the same axis, they are found to be anti-correlated. This means that the random outcome of the measurement made on one particle seems to have been transmitted to the other, so that it can make the “right choice” when it is measured. The distance and timing of the measurements can be chosen so as to make the interval between the two measurements spacelike, i.e. from any of the two measuring events to the other a message would have to travel faster than light. Then, according to the principles of special relativity, it is not in fact possible for any information to travel between two such measuring events—it is not even possible to say which of the measurements came first, as this would depend on the inertial system of the observer. Therefore the correlation between the two measurements cannot appropriately be explained as one measurement determining the other: different observers would disagree about the role of cause and effect. The hidden variables theory fails, however, when we consider measurements of the spin of entangled particles along different axes (for example, along any of three axes which make angles of 120 degrees). If a large number of pairs of such measurements are made (on a large number of pairs of entangled particles), then statistically, if the local realist or hidden variables view were correct, the results would always satisfy Bell’s inequality. A number of experiments have shown in practice, however, that Bell’s inequality is not satisfied. This tends to confirm that the original formulation of quantum mechanics is indeed correct, in spite of its apparently paradoxical nature. Even when measurements of the entangled particles are made in movingrelativistic reference frames, in which each measurement (in its own relativistic time frame) occurs before the other, the measurement results remain correlated. The fundamental issue about measuring spin along different axes is that these measurements cannot have definite values at the same time―they areincompatible in the sense that these measurements’ maximum simultaneous precision is constrained by the uncertainty principle. This is contrary to what is found in classical physics, where any number of properties can be measured simultaneously with arbitrary accuracy. It has been proven mathematically that compatible measurements cannot show Bell-inequality-violating correlations, and thus entanglement is a fundamentally non-classical phenomenon. In a 2012 experiment, “delayed-choice entanglement swapping” was used to decide whether two particles were entangled or not after they had already been measured. In a 2013 experiment, entanglement swapping has been used to create entanglement between photons that never coexisted in time, thus demonstrating that “the nonlocality of quantum mechanics, as manifested by entanglement, does not apply only to particles with spacelike separation, but also to particles with timelike [i.e., temporal] separation”. In three independent experiments it was shown that classically-communicated separable quantum states can be used to carry entangled states. In August 2014, researcher Gabriela Barreto Lemos and team were able to “take pictures” of objects using photons that have not interacted with the subjects, but were entangled with photons that did interact with such objects. Lemos, from the University of Vienna, is confident that this new quantum imaging technique could find application where low light imaging is imperative, in fields like biological or medical imaging. Another theory explains quantum entanglement using special relativity. According to this theory, faster-than-light communication between entangled systems can be achieved because the time dilation of special relativity allows time to stand still in light’s point of view. For example, in the case of two entangled photons, a measurement made on one photon at present time would determine the state of the photon for both the present and past at the same moment. This leads to the instantaneous determination of the state of the other photon. Corresponding logic is applied to explain entangled systems, i.e. electron and positron, that travel below the speed of light. There is much confusion about the meaning of entanglement, non-locality and hidden variables and how they relate to each other. As described above, entanglement is an experimentally verified and accepted property of nature, which has critical implications for the interpretations of quantum mechanics. The question becomes, “How can one account for something that was at one point indefinite with regard to its spin (or whatever is in this case the subject of investigation) suddenly becoming definite in that regard even though no physical interaction with the second object occurred, and, if the two objects are sufficiently far separated, could not even have had the time needed for such an interaction to proceed from the first to the second object?” The latter question involves the issue of locality, i.e., whether for a change to occur in something the agent of change has to be in physical contact (at least via some intermediary such as a field force) with the thing that changes. Study of entanglement brings into sharp focus the dilemma between locality and the completeness or lack of completeness of quantum mechanics. Bell’s theorem and related results rule out a local realistic explanation for quantum mechanics (one which obeys the principle of locality while also ascribing definite values to quantum observables). However, in other interpretations, the experiments that demonstrate the apparent non-locality can also be described in local terms: If each distant observer regards the other as a quantum system, communication between the two must then be treated as a measurement process, and this communication is strictly local. In particular, in the many worlds interpretation, the underlying description is fully local. More generally, the question of locality in quantum physics is extraordinarily subtle and sometimes hinges on precisely how it is defined. In the media and popular science, quantum non-locality is often portrayed as being equivalent to entanglement. While it is true that a bipartite quantum state must be entangled in order for it to produce non-local correlations, there exist entangled states that do not produce such correlations. A well-known example of this is the Werner state that is entangled for certain values of , but can always be described using local hidden variables. In short, entanglement of a two-party state is necessary but not sufficient for that state to be non-local. It is important to recognise that entanglement is more commonly viewed as an algebraic concept, noted for being a precedent to non-locality as well as to quantum teleportation and to superdense coding, whereas non-locality is defined according to experimental statistics and is much more involved with the foundations and interpretations of quantum mechanics. The following subsections are for those with a good working knowledge of the formal, mathematical description of quantum mechanics, including familiarity with the formalism and theoretical framework developed in the articles: bra–ket notation and mathematical formulation of quantum mechanics. States of the composite system which can be represented in this form are called separable states, or (in the simplest case) product states. This state is separable if there exist so that yielding and It is inseparable if for all we have If a state is inseparable, it is called an entangled state. If the composite system is in this state, it is impossible to attribute to either system A or system B a definite pure state. Another way to say this is that while the von Neumann entropy of the whole state is zero (as it is for any pure state), the entropy of the subsystems is greater than zero. In this sense, the systems are “entangled”. This has specific empirical ramifications for interferometry.It is worthwhile to note that the above example is one of four Bell states, which are (maximally) entangled pure states (pure states of the HA ⊗ HB space, but which cannot be separated into pure states of each HA andHB). Alice measures 0, and the state of the system collapses to . Alice measures 1, and the state of the system collapses to . If the former occurs, then any subsequent measurement performed by Bob, in the same basis, will always return 1. If the latter occurs, (Alice measures 1) then Bob’s measurement will return 0 with certainty. Thus, system B has been altered by Alice performing a local measurement on system A. This remains true even if the systems A and B are spatially separated. This is the foundation of the EPR paradox. The outcome of Alice’s measurement is random. Alice cannot decide which state to collapse the composite system into, and therefore cannot transmit information to Bob by acting on her system. Causality is thus preserved, in this particular scheme. For the general argument, see no-communication theorem. where the positive valued wi sum up to 1, and in the infinite-dimensional case, we would take the closure of such states in the trace norm. We can interpret ρ as representing an ensemble where wi is the proportion of the ensemble whose states are . When a mixed state has rank 1, it therefore describes a pure ensemble. When there is less than total information about the state of a quantum system we need density matrices to represent the state. where pi are positive valued probabilities, ‘s and ‘s are themselves states on the subsystems A and B respectively. In other words, a state is separable if it is a probability distribution over uncorrelated states, or product states. We can assume without loss of generality that and are pure ensembles. A state is then said to be entangled if it is not separable. In general, finding out whether or not a mixed state is entangled is considered difficult. The general bipartite case has been shown to be NP-hard. For the 2 × 2 and 2 × 3 cases, a necessary and sufficient criterion for separability is given by the famous Positive Partial Transpose (PPT) condition. Experimentally, a mixed ensemble might be realized as follows. Consider a “black-box” apparatus that spits electrons towards an observer. The electrons’ Hilbert spaces are identical. The apparatus might produce electrons that are all in the same state; in this case, the electrons received by the observer are then a pure ensemble. However, the apparatus could produce electrons in different states. For example, it could produce two populations of electrons: one with state with spins aligned in the positive z direction, and the other with state with spins aligned in the negative y direction. Generally, this is a mixed ensemble, as there can be any number of populations, each corresponding to a different state. ρA is sometimes called the reduced density matrix of ρ on subsystem A. Colloquially, we “trace out” system B to obtain the reduced density matrix on A. In general, a bipartite pure state ρ is entangled if and only if its reduced states are mixed rather than pure. Reduced density matrices were explicitly calculated in different spin chains with unique ground state. An example is the one-dimensional AKLT spin chain: the ground state can be divided into a block and an environment. The reduced density matrix of the block is proportional to a projector to a degenerate ground state of another Hamiltonian. The reduced density matrix also was evaluated for XY spin chains, where it has full rank. It was proved that in the thermodynamic limit, the spectrum of the reduced density matrix of a large block of spins is an exact geometric sequence in this case. In this section, the entropy of a mixed state is discussed as well as how it can be viewed as a measure of quantum entanglement. 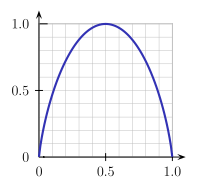 The plot of von Neumann entropy Vs Eigenvalue for a bipartite 2-level pure state. When the eigenvalue has value .5, von Neumann entropy is at a maximum, corresponding to maximum entanglement. As in statistical mechanics, the more uncertainty (number of microstates) the system should possess, the larger the entropy. For example, the entropy of any pure state is zero, which is unsurprising since there is no uncertainty about a system in a pure state. The entropy of any of the two subsystems of the entangled state discussed above is log(2) (which can be shown to be the maximum entropy for 2 × 2 mixed states). Entropy provides one tool which can be used to quantify entanglement, although other entanglement measures exist. If the overall system is pure, the entropy of one subsystem can be used to measure its degree of entanglement with the other subsystems. For bipartite pure states, the von Neumann entropy of reduced states is the unique measure of entanglement in the sense that it is the only function on the family of states that satisfies certain axioms required of an entanglement measure. For mixed states, the reduced von Neumann entropy is not the unique entanglement measure. Indeed, without the above property, the von Neumann entropy would not be well-defined. In particular, U could be the time evolution operator of the system, i.e. where H is the Hamiltonian of the system. This associates the reversibility of a process with its resulting entropy change, i.e., a process is reversible if, and only if, it leaves the entropy of the system invariant. This provides a connection between quantum information theory and thermodynamics. Rényi entropyalso can be used as a measure of entanglement. Therefore the march of the arrow of time towards thermodynamic equilibrium is simply the growing spread of quantum entanglement. Entanglement measures quantify the amount of entanglement in a bipartite quantum state. As aforementioned, entanglement entropy is the standard measure of entanglement for pure states (but no longer a measure of entanglement for mixed states). For mixed states, there are some entanglement measures in the literature and no single one is standard. Most (but not all) of these entanglement measures reduce for pure states to entanglement entropy, and are difficult (NP-hard) to compute. The Reeh-Schlieder theorem of quantum field theory is sometimes seen as an analogue of quantum entanglement. Physicists say that time is an emergent phenomenon that is a side effect of quantum entanglement. The Wheeler–DeWitt equation that combines general relativity and quantum mechanics – by leaving out time altogether – was introduced in 1960s and it was a huge problem for the scientific community until in 1983, when the theorists Don Page and William Wootters made a solution based on the quantum phenomenon of entanglement. Page and Wootters showed how entanglement can be used to measure time. In 2013, at the Istituto Nazionale di Ricerca Metrologica (INRIM) in Turin, Italy, Ekaterina Moreva, together with Giorgio Brida, Marco Gramegna, Vittorio Giovannetti, Lorenzo Maccone, and Marco Genovese performed the first experimental test of Page and Wootters’ ideas. They confirmed that time is an emergent phenomenon for internal observers but absent for external observers of the universe. Physicist Seth Lloyd says that quantum uncertainty gives rise to entanglement, the putative source of the arrow of time. According to Lloyd; “The arrow of time is an arrow of increasing correlations.”. Entanglement has many applications in quantum information theory. With the aid of entanglement, otherwise impossible tasks may be achieved. Among the best-known applications of entanglement are superdense coding and quantum teleportation. Most researchers believe that entanglement is necessary to realize quantum computing (although this is disputed by some). Entanglement is used in some protocols of quantum cryptography. This is because the “shared noise” of entanglement makes for an excellent one-time pad. Moreover, since measurement of either member of an entangled pair destroys the entanglement they share, entanglement-based quantum cryptography allows the sender and receiver to more easily detect the presence of an interceptor. In interferometry, entanglement is necessary for surpassing the standard quantum limit and achieving the Heisenberg limit. There are several canonical entangled states that appear often in theory and experiments. These four pure states are all maximally entangled (according to the entropy of entanglement) and form an orthonormal basis (linear algebra) of the Hilbert space of the two qubits. They play a fundamental role in Bell’s theorem. which reduces to the Bell state for . The traditional GHZ state was defined for . GHZ states are occasionally extended to qudits, i.e. systems of d rather than 2 dimensions. Also for M>2 qubits, there are spin squeezed states. Spin squeezed states are a class of states satisfying certain restrictions on the uncertainty of spin measurements, and are necessarily entangled. This is like a Bell state except the basis kets 0 and 1 have been replaced with “the N photons are in one mode” and “the N photons are in the other mode”. Finally, there also exist twin Fock states for bosonic modes, which can be created by feeding a Fock state into two arms leading to a beam-splitter. They are the sum of multiple of NOON states, and can used to achieve the Heisenberg limit. For the appropriately chosen measure of entanglement, Bell, GHZ, and NOON states are maximally entangled while spin squeezed and twin Fock states are only partially entangled. The partially entangled states are generally easier to prepare experimentally. Entanglement is usually created by direct interactions between subatomic particles. These interactions can take numerous forms. One of the most commonly used methods is spontaneous parametric down-conversion to generate a pair of photons entangled in polarisation. Other methods include the use of a fiber coupler to confine and mix photons, the use of quantum dots to trap electrons until decay occurs, the use of the Hong-Ou-Mandel effect, etc. In the earliest tests of Bell’s theorem, the entangled particles were generated using atomic cascades. It is also possible to create entanglement between quantum systems that never directly interacted, through the use of entanglement swapping. Systems which contain no entanglement are said to be separable. For 2-Qubit and Qubit-Qutrit systems (2 x 2 and 2 x 3 respectively) the simple Peres-Horodecki criterion provides both a necessary and a sufficient criterion for separability, and thus for detecting entanglement. However, for the general case, the criterion is merely a sufficient one for separability, as the problem becomes NP-hard. A numerical approach to the problem is suggested byJon Magne Leinaas, Jan Myrheim and Eirik Ovrum in their paper “Geometrical aspects of entanglement”. Leinaas et al. offer a numerical approach, iteratively refining an estimated separable state towards the target state to be tested, and checking if the target state can indeed be reached. An implementation of the algorithm (including a built in Peres-Horodecki criterion testing) is brought in the “StateSeparator” web-app.